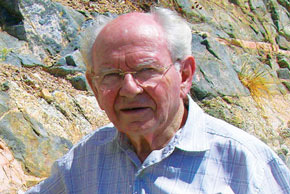 Ariel A. Roth has published extensively on the creation-evolution issue for over 50 years and is a leading figure in Flood geology. He is a former professor of biology and director of the Geoscience Research Institute at the Loma Linda University in the USA and editor of the scientific journal Origins. Roth has a B.A. in Biology from the Pacific Union College and a M.S. and Ph.D. in biology from the University of Michigan. In addition he has qualifications in radiation biology from the University of California at Berkley and in geology and mathematics from the University of California at Riverside. He is a member of the Geological Society of America and the Society for Sedimentary Geologists. Roth is a prolific author of scientific papers in the fields of biology and geology as well as of the book Origins: Linking Science and Scripture. For more information see interview with Ariel Roth. See also his chapter in In Six Days.